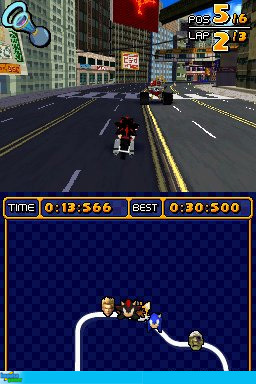 Here he comes, here comes speed racer… well not really but it’s close as Sonic, Shadow and friends, even enemies unit together in this All-Stars racing game which even highlights the diverse history of one of the world’s most famed gaming companies… SEGA! 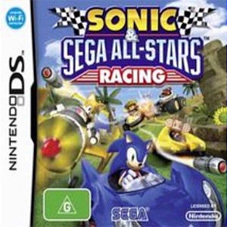 Reminiscent of the classic Nintendo game, Mario Kart DS, Sonic & SEGA All-Stars Racing is almost on par with that other popular game, thanks to its sturdy gameplay, great controls and of course, all those colourfully famous and not so famous SEGA characters. Mario Kart is still a classic, however SEGA have managed to dethrone their opposition with their latest whacky racing title. When it comes to the crunch, the game may just be another “kart” game but at its family friendly gaming heart, it’s much much more. Offering four modes of play and even multiplayer excitement, this is the perfect title for mindless entertainment that Dr. Eggman has ordered. In terms of gameplay, it has a single race, time trial, grand prix and a mission mode. In the single race, you drive against seven AI controlled characters but my favourite is the grand prix which allows you to race a variety of different cups. Mission mode allows you to build money and frequent driving miles. Needless to say, it has a gaming mode for all different occasions, whether you’re having a quick burl in the backseat of the car or sitting down for a huge grand prix session, the gameplay modes are definitely all there. 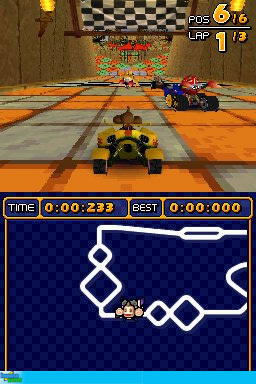 Once again, Mario Kart is the template of these kart games and although SEGA have not attempted to recreate the wheel, for me, the biggest difference are the SEGA characters themselves who are quite colourful and fun to race and race against. Even the controls mirror Mario Kart and that’s a good thing in our books as the controls were quite responsive and tight. With the controls, it works well on the DS with the d-pad used for controlling your vehicle, A for accelerate, B for brake, Left shoulder button for item use and Right shoulder button for drift/turbo. You might ask where is the touch screen but it would be make the game less playable if this was an option for racing. Nothing is more fun than using your speed boosts, weapons and special manoeuvres to become the winner. There is even a cool drift option and as you drift around tracks but more specifically, this increases your speed boosts to race along. In terms of special manoeuvres which is called the All-Star move, it can be used by the player if they’re coming last which is actually quite fun to pull off. Best of all, the All-Star moves are based on the characters universes that you are playing such as Sonic who uses his sonic superspeed to catch up or Dr. Eggman who runs over his opponents as he catches up. Even though the moves may sound quite deadly, they are actually quite fair to use and really sparked our interest about all the characters involved in the game. With unlockable content, the gamer must collect miles as they embark on a variety of different races and these are then used to unlock additional songs, racers and tracks. Even though (I stress again), the gameplay is very fun and competent, this is a great little bonus to egg you on. Last but not least, there is a trophy system to see how well or poorly, you’ve raced. The game even contains a strong multiplayer portion with up to four players which is another that includes traditional races, battle arenas and knockout races. These are definitely like Mario Kart but with improved graphics and of course those whacky SEGA characters which runs quite smoothly. The multiplayer mimics its console brothers quite well. Graphically, the title is quite zany as you race strange vehicles like bananas and shoot boxing gloved missiles to take out your opponents. 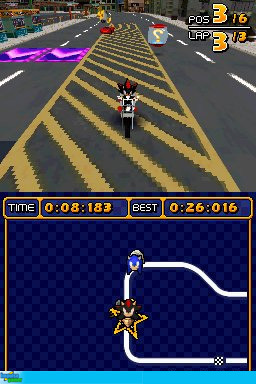 Even on the DS, all the SEGA characters come across quite well and there is a true sense of speed which mimics the Sonic games. The environments are well designed from casinos to jungles with some good attention to detail. It should also be noted that the game is quite colourful and comes together well with the gameplay. Last but not least is the sound which is just as good as the graphics. Even the music features that traditional SEGA theme, albeit MIDI. In conclusion, Sonic & Sega All-Stars Racing is a thoroughly enjoyable racing title for the DS that proves that Nintendo does not hold the monopoly on kart games. With great graphics, fun gameplay and more importantly perfect tracks and vehicles, this is what DS gaming is all about and this game highlights just that. It’s also great to see the various SEGA characters from Sonic to Alex Kidd and even the chick from Space Channel 5, perfectly cast indeed. If you’re after a game that can be played over and over again, than this is it… check it out!